Of course, Singapore will always be in the list. If there’s one thing a lot of people like about Netflix, it is definitely the variety of content as well as their original series. And recently, Netflix has announced a new series that’ll work well with the Asian audience except, well, maybe Malaysians. The new series titled ‘Street Food Asia’ showcases all the amazing food you can find on the streets (obviously) across Asia. And the list of Asian countries that’ll be featured in the series are India, Singapore, Indonesia, Japan, South Korea, Philippines, Taiwan, Thailand, and Vietnam. Something seems missing from the list, right? Well, it’s… MALAYSIA! A lot of people, including non-Malaysians, weren’t happy with the list and thought that our country deserved to be on the list as well. Because, let’s be real, most of the food you find in Singapore are originally from Malaysia. And the four food that will be highlighted in the Singapore episode are putu piring, wanton noodles, chili crab, and chicken rice. HAHAHAHAHAHAHAHAAHAHAHAHAHAHAHAHAHAHAHAHAHAHAHAHAHAHAHAHAHAHAAHAHAHAHAHAHAHAHAHAHAHAHAHAHAHAHAHA Malaysia not on the list? damn u! What the hell? Just come to Malaysia and taste it. Do your homework properly. So, will you guys still be watching the show considering they left Malaysia out? Perhaps Netflix should produce a second season featuring street food from all the states in Malaysia. 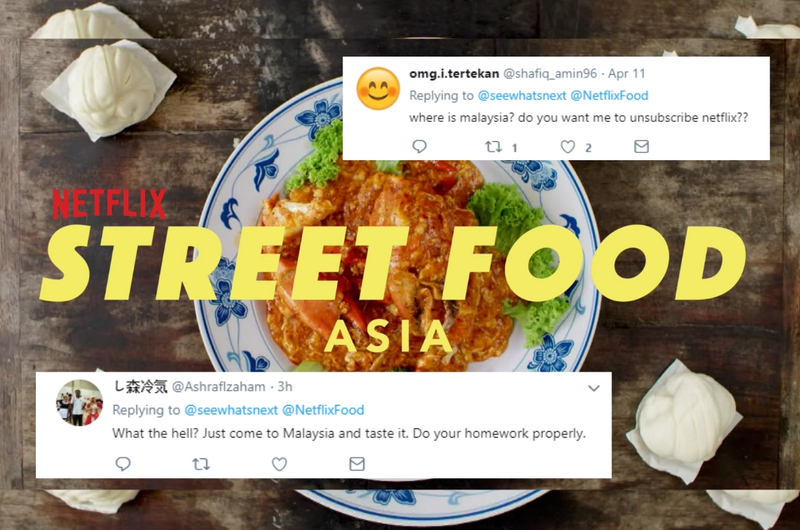 ‘Street Food Asia’ premieres exclusively on Netflix on 26 April 2019.